The brake fluid level can be checked at a glance. 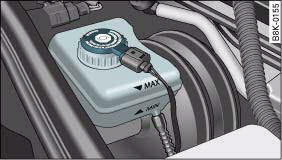 – Check the fluid level on the brake fluid reservoir ⇒ fig. 258. It should always be between the “MIN” and “MAX” marks. In right-hand drive vehicles the brake fluid reservoir is on the other side of the engine compartment. The fluid level may drop slightly after a period of time due to the automatic compensation for brake pad wear. This is quite normal. However, if the level goes down noticeably in a short time, or drops below the “MIN” mark, there may be a leak in the brake system. If the fluid level in the reservoir is too low, this will be indicated by the brake warning lamp. If this should happen, take the car to a qualified workshop immediately and have the brake system inspected. When required, the brake fluid should be changed by a competent mechanic with the proper equipment. Brake fluid gradually absorbs moisture from the atmosphere. If the water content in the brake fluid is too high, this may cause corrosion in the brake system over time. In addition, the boiling point of the brake fluid will be considerably reduced. This could adversely affect the braking ability in certain circumstances. For this reason the brake fluid must be changed periodically. Your vehicle's Service Schedule will tell you when the brake fluid has to be changed. It is advisable to have the brake fluid changed as part of a regular Inspection Service at your Audi workshop. They are familiar with the procedure and have the necessary special tools and spare parts as well as the proper facilities for disposing of the old fluid. Use only the genuine brake fluid specified by the factory Qualified workshops know that the brake fluid “DOT 4” is approved by Audi. The brake fluid must be fresh and unused. • Brake fluid is poisonous; store it in the sealed original container in a safe place out of reach of children. • Heavy use of the brakes may cause a vapour lock if the brake fluid is left in the system for too long. This would seriously affect the efficiency of the brakes and the safety of the car – risk of accident. Please note that brake fluid will attack the paintwork on contact. If the fluid has to be drained out of the brake system, use an appropriate container to catch the used brake fluid and dispose of it in the proper manner.